Guests: Claude Saks, Sarah Meinzer, Stan Rodin, Phyllis dePicciotto. We estimate $2,800 in profit in the drinks booths. Jody D. says thanks to front gate workers. Julie J. did a great job with the kids and with face painting for Bill Boyd. Janet N. thanked everyone in the food booth. Gary J. said contestant stage was a success. Sherrie F. and Joanne S. kept the musicians happy backstage. Scott B. thanked the president for the good weather. Sandy G. said photos have appeared in Noozhawk. Also, thanks to Walt Stephens. 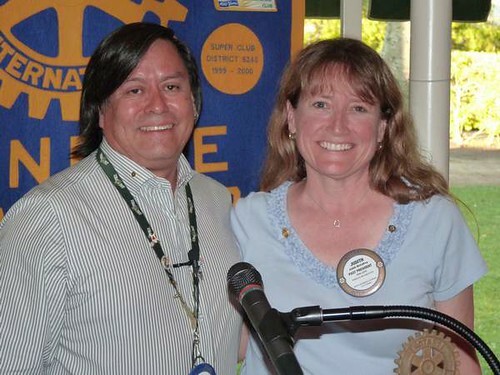 David Velarde thanked other clubs’ Rotarians. Diana C. thanked the Boy Scouts for helping with the parking and Scott Johnson for organizing volunteers. Andy D. seconds what all said and thanks sponsors, including Citrix. The event is a gem. It’s unique. David Velarde presented a 10-year pin to Chris B.; a past President’s badge to Joe W.
Joe W. presented a past president badge to Bill B..
David Velarde presented a Paul Harris Fellow +7 to Judith M.
Don’t miss out on our Halloween meeting. Sarah is part of the Alliance for Living and Dying Well. Stan had learned that only 8-9% of patients dying at Cottage Hospital had advanced directives for their care. Four years prior, it was only 4%. News flash: People don’t like to talk about death. 42% of the time when advanced directives were in place but the individual could not make their decision, family overrode the directive. About 75% of people would prefer to die at home, and only about 25% get to. Phyllis and Stan have different philosophies about end of life, so don’t assume you know what others in your life — even your spouse — want. When you are not capable of making your own informed decisions (dementia, coma, brain injury), you are not in control. Does your family know how to do what you would have done if you could have decided? Phyllis told her 3 daughters that for her birthday she wanted to have supper and talk about her death. The daughters resisted. She set the expectation that this was he first of a few conversations, and they did it. Five Wishes helps guide the decisions people need to make and what needs to be discussed with the people in your life. They offer trainings about how to use Five Wishes. Alliance for Living and Dying well includes representatives from health and charitable organizations throughout the area. Susan Plummer was hired as Executive director. See the schedule of upcoming Five Wishes workshops. Your choices may change, so if you already have an end-of-life medical directive, review it often. Garden Court has ongoing sessions for people. Chris Tucker has been trained to be a trainer. Five Wishes can be scanned into the health records at Cottage Hospital system. Choose a health care agent who will honor the choices you have documented. Don’t default to the person emotionally closest to you; choose the person who can follow your directive even when in distress. One guest sent a letter to kids with directive and listing where all the resources are. 15 dictionaries will be donated to 3rd graders in Santa Barbara in honor of our speakers. ← Did you see our club president on the Internet?